This Halloween season, One World Symphony and Artistic Director Sung Jin Hong present a "Halloween Spectaculaire" of swirling visions, bewitched imaginings, and surreal dreams. Showcasing both classical and new music and true to its tradition of innovative programming, the orchestra will electrify audiences with a spectacle featuring the spirit of Halloween -- imagination! Igor Stravinsky's The Firebird (1919) transports us to a fantasy kingdom that is redeemed by mysterious and magical bird. With stunning precision, the 28-year-old composer's orchestration evokes evil henchmen, diabolical spells, and a glorious fairy-tale wedding. 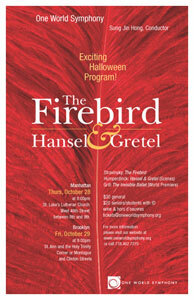 Like The Firebird, Engelbert Humperdinck's opera Hansel and Gretel (1893) is a spirited, colorful fable. One World Symphony -- with vocal soloists -- will perform highlights from this masterpiece. The imagination is the foundation of The Invisible Ballet (2004), a world-premiere work by Stanley Grill, which was written with the intention of actively exercising the imaginations of the audience members through sound alone. The composer was intrigued by the idea of a full auditorium, each person envisioning a unique and personal image of what the music describes -- images that will never be realized in the physical world but nonetheless exist and are real. One World Symphony's exuberance, virtuosity, and renowned attention to detail are sure to be beyond your wildest dreams. Feed your imagination with Halloween music that will delight audiences of all ages!